An overwhelming sense of nostalgia engulfed us as we emerged from Camden Town tube station to wafts of incense and street musicians strumming their guitars. The market itself, a short stroll from the station, has recently been given a new lease of life thanks to one of London’s most loved street-food collectives–KERB. A strict vetting process precedes becoming a KERB trader, which ensures only the best are given a space. New entrants become inKERBators; once they find their feet, they're given the green light by KERB and morph into fully-fledged KERBanists. Looking at the loyal tribe of KERB fans, the model clearly works: 35 traders now operate seven days a week. Entering over the Regent’s Canal footbridge afforded a great overview of the proceedings. There was a definite chill in the air and sustenance was required quickly. 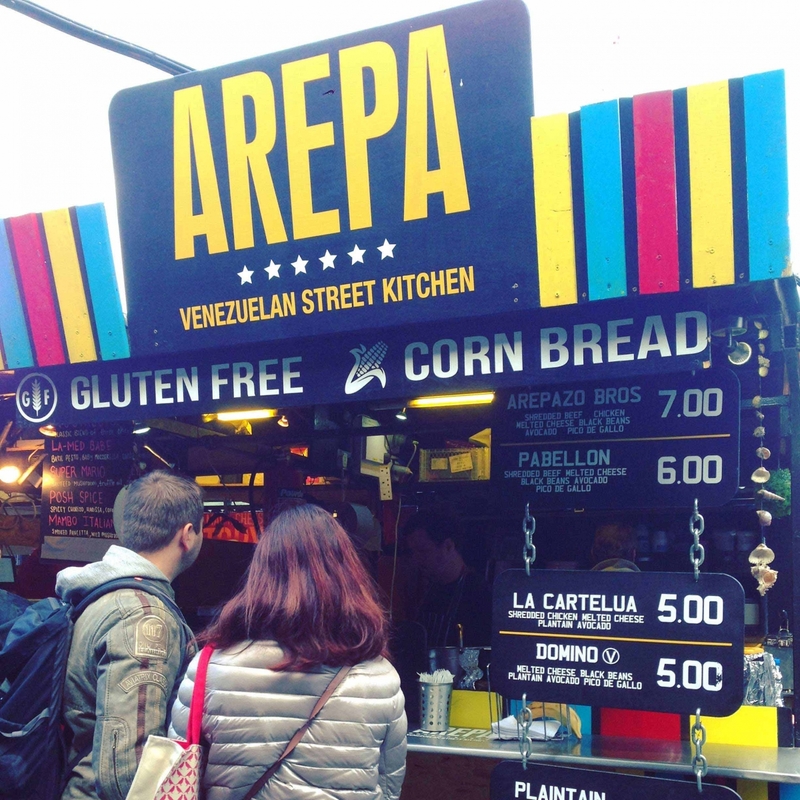 We made a beeline to KERBanist and “trader of the week”–Venezulan father and son duo Arepazo Bros–whose product is a crisp cornbread known as arepa. Arepa resemble bao (the steamed Taiwanese buns that make Londoners go weak at the knees) although these are fried and slightly larger. The signature dish (arepa) included shredded beef and chicken. We were handed a paper plate folded in two with the arepa in its own little paper pocket. Perched on top was some crisp plantain, which we picked off and ate before diving into the rest. Pro tip: Don’t wear your best white shirt when eating an arepa; there’s no polite way to eat it. Appropriate food for a date as it cuts through formalities right after the first bite. It's delicately crisp on the outside, and softer as you break through the exterior. A whole new world seemed to open up as we munched our way through the entire parcel: the slow-cooked shredded beef and chicken were moist, and melded easily with the melted cheese, avocado and pico de gallo. Each bite was memorable, to the extent that it requires a lot of self-restraint to not jump on the Northern Line and zip up to Camden to sample another whilst writing this review. A splash of zingy lime-juice and a little more chilli in the pico de gallo would have made it a home run, but other than that it was the stuff of dreams–albeit a slightly greasy one. Although the menu is short, it's great comfort food if not a hangover curative. Other traders like Kimchinary, Killadilla and Kolkati looked equally inviting: KERB has done an excellent job of curating an exciting sweep of cuisines and it’s well worth a trip. We’ll be back soon to sample others and linger longer, stopping for an irresistible arepa, of course. It would be rude not to. Opening hours: Mon-Thurs 11am-6pm; Fri-Sun 11am-7pm.